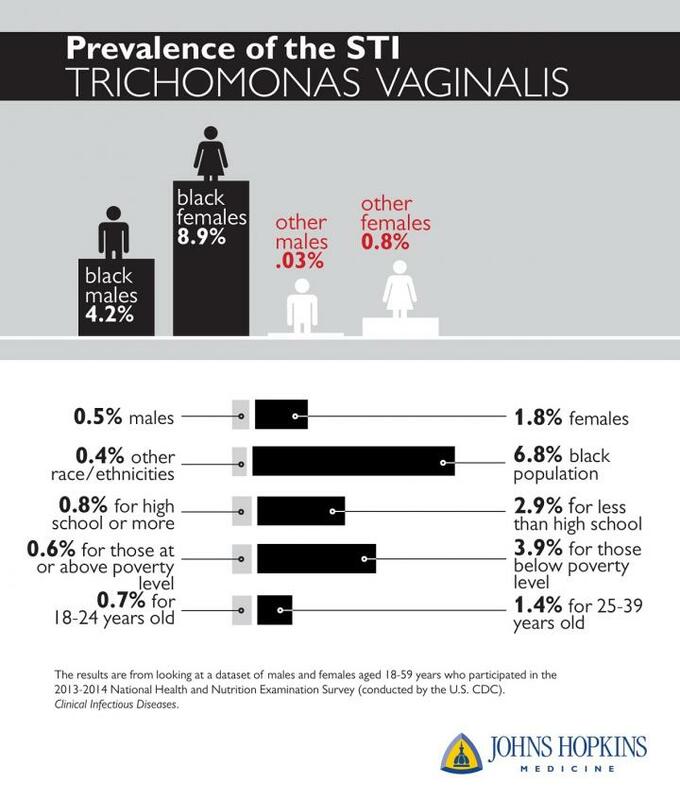 In a new Johns Hopkins study, researchers have added to evidence that Trichomonas vaginalis (TV), the world's most common curable sexually transmitted infection (STI), disproportionately affects the black community. A report of the findings, published March 15 in Clinical Infectious Diseases, highlights the major racial/ethnic disparities in TV infection in the United States population, calling on the need to improve racial equity in sexual health. "These findings are likely reflective of real social and structural disparities, such as lower access to health care, that result in high infection rates in the black community. Targeted public health education about Trichomonas will be critical," says Aaron Tobian, M.D., Ph.D., associate professor of pathology at the Johns Hopkins University School of Medicine and the study's senior author. Trichomonas vaginalis infection is caused by a protozoan parasite and is asymptomatic in most people. In women, TV infection cases can be characterized by a foul-smelling vaginal discharge, painful urination and abdominal pain. Similar urination and abdominal symptoms can be seen in men. However, if TV infection is left untreated, it can lead to severe consequences in women, such as pelvic inflammatory disease and infertility. Unlike with some other STIs, there are currently no routine surveillance or reporting programs for TV in the United States, and only two previous studies have ever examined its prevalence on a national scale, according to Tobian. Those studies, he says, only focused on women or a younger population. To examine the prevalence of TV infection in both males and females 18 to 59 years old, Tobian and colleagues used data from the 2013-2014 National Health and Nutrition Examination Survey, a collection of health information from the United States' noninstitutionalized, civilian population that includes valid TV results from urine samples. Of the 4,057 participants, 1,942 were males, 2,115 were females, 822 identified as non-Hispanic black and 3,235 identified as other races/ethnicities. While the prevalence of TV infection was 0.03 and 0.8 percent among males and females of other races/ethnicities, the burden of TV infection was significantly higher among black males and females: 4.2 percent and 8.9 percent, respectively. Higher prevalence of TV infection was associated with being female, black, older, having less than a high school education and living below poverty level, independent of having multiple sexual partners. TV prevalence was also higher among older individuals (i.e., 25-59 years old compared to age 18-24). People below poverty level had a prevalence of 3.9 percent versus 0.6 percent for those at or above poverty level, and individuals without a high school education had a prevalence of 2.9 percent versus 0.8 percent for those with at least a high school education. Currently, screening for TV infection is only recommended for people who are HIV-positive. Eshan U. Patel, M.P.H., lead author of the study, says the new findings should encourage broader screening initiatives, educational programming and policy changes to ensure access to sexual health care. "It's unfortunate that TV infection hasn't received a stronger public health response, especially since it is easy to diagnose and treat," says Patel. TV infection can be detected using the same diagnostic platform as the one used for Chlamydia and can be cured with just one pill (metronidazole). Other authors on this study include Charlotte A. Gaydos and Zoe R. Packman of the Johns Hopkins University School of Medicine, and Thomas C. Quinn of the National Institute of Allergy and Infectious Diseases.